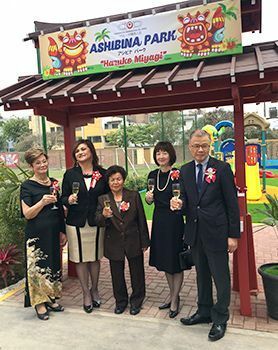 The Okinawa Association of Peru (AOP – Spanish: Asociación Okinawense del Perú) opened a children’s playground named “Ashibina Park” on the grounds of their community center in the suburbs of Lima on November 3. The same day, the group held an opening ceremony where Japanese Ambassador to Peru Sadayuki Tsuchiya, AOP president Maria Luisa Kohatsu, Okinawa Women’s Association (AFO – Spanish: Asociación Femenina Okinawense del Perú) president Eiko Okugi, and AFO advisor Haruko Miyagi cut the ceremonial tape, celebrating the completion of a dream they had held for many years. Ashibina Park covers 400 square meters of land behind the AOP community center, and is already equipped with four large and two small play structures. There is also in place a strip of artificial grass in the spacious play area, and it is expected to be a place to nurture the dreams of children. The playground was constructed for the sake of AOP member families, however the park is also open to non-members for a fee. The construction cost of Ashibina Park was 60,000 dollars. Beginning with the AFO, four savings associations, companies owned by Okinawan-Peruvians, and AOP members, contributions were also gathered from the Okinawa-based Kanehide Holdings Co. Ltd., the Okinawa-Peru Association, and other individual donors.